Number of pages: 246 p.
Life isn't bad for psychic Jolie Wilkins. True, she doesn't have a love life to speak of, but she has a cute house in the suburbs of Los Angeles, a cat and a quirky best friend Christa. Jolie: The story is told from Jolie's point of view only. Jolie is such a character, she reminded me a bit of Bridget Jones (in the movie, I haven't read the books, shame on me I know), minus the overweighted part. Jolie also gets into those strange and awkward situations which made me laugh out loud. Also she doesn't believe she is a witch nor that she has an incredible power. Rand: He is the to-die-for warlock, secretive, strange in some ways and very protective of Jolie. Although he has trouble explaining himself, nor does he seem to know what he wants. I think he fights a lot of battles in his head. This makes him an awesome character. Christa: The remarkable thing about Christa is that she doesn't seem to be bother by the fact that the underworld exists. She walks inside a room filled with vampires, werewolves, demons, witches and warlocks without hesitation. She is a wonderful side character, also she is from now on my favourite bookish best friends! Sinjin: Oh Sinjin, a vampire and a very old one at that. I am still not sure what his motives are. He is Always the gentlemen when it comes to Jolie. He's hot, a real ladies men but in a way that is very charming. I liked the conversations between Jolie and Sinjin, mostly because of the language use. He turns out to be a pretty decent vampire. The first thing that made me want to read this book was the funny cover. It promised laughing out loud, which was a promise that was kept! I laughed a lot which was good, the subject matter was light, not many shocking event that want to make you cry nor emotionally draining. Just a quick light read! The story some journey! 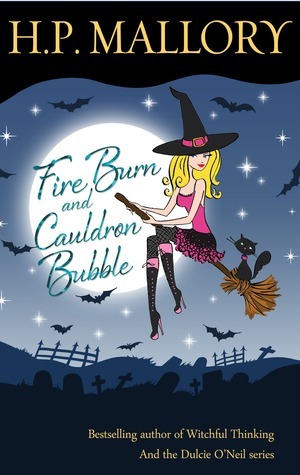 with lots of bumps, magic, hot man, wicked witches, thirsty vampires, funny ghosts on the way. At least it didn't have a major cliffhanger on the end pfiieew! I will continue this series, I am curious what the author has in store for us in the next books! I hope lots of fun! All in all I just enjoyed this story very much. Great characters, worldbuilding and writing! So that means 4 stars! This song describes the relationship between Rand and Jolie. It also made me think of the scene where Jolie will have to defeat an faerie.